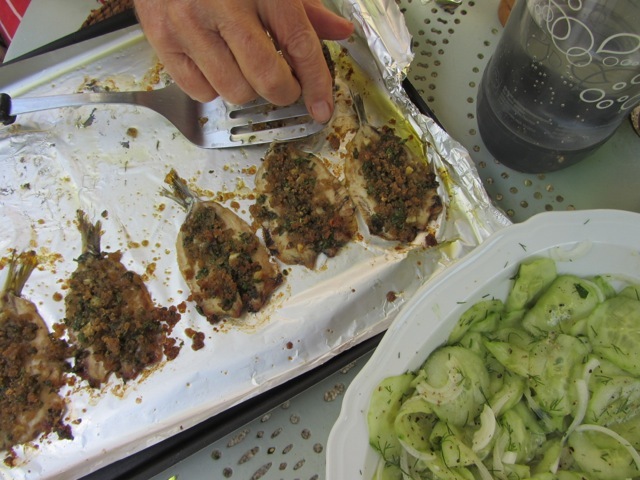 Sardines–to go with the cucumber salad! We had these again yesterday for lunch with a reprise of the cucumber salad. Filleted fresh sardines, sometimes available at the fishmonger, make life easier–though I remember feeling very virtuous after filleting sixty sardines with my cooking partner for a workshop Meredith ran a few years back. We were rewarded with a loud exclamation of “LOOK at THAT!” from one of the participants, when he saw the wide sardine-laden platter. Butterflied sardines for 2 takes less time!! Butterfly filleting is a bit of a business–but rewarding. You’ll need a chopping board and plenty of kitchen paper. Have a pair of scissors to hand and a plate to receive the fillets. Ensure there are no scales left on the fish, then (for right-handed cooks) hold the the fish in your left hand belly up and with a pair of scissors snip along the belly from the tail end cutting off the head when you reach it. Then with your right thumb, coax out the rest of the innards. Place the fish, belly side down on the board and press gently up and down the backbone with both thumbs–to open it up and out. Flatten the fish as much as you can with three fingers of both hands. Lift the small fin and and snip it off, then cut the backbone at the tail end and draw it carefully away from the body, taking care not to take too much of the flesh with it. Voila! You have a butterflied fillet. Wash and dry the fillets. Place a sheet of foil on a shallow baking tray (makes clean-up easier!). 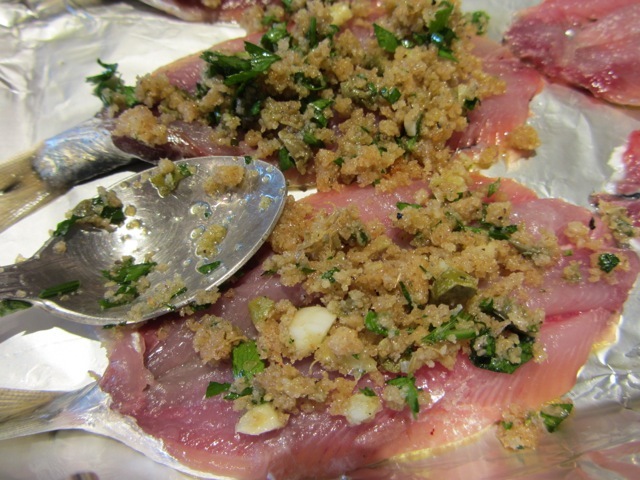 Using a basting brush, spread a tablespoon of oil on the foil. 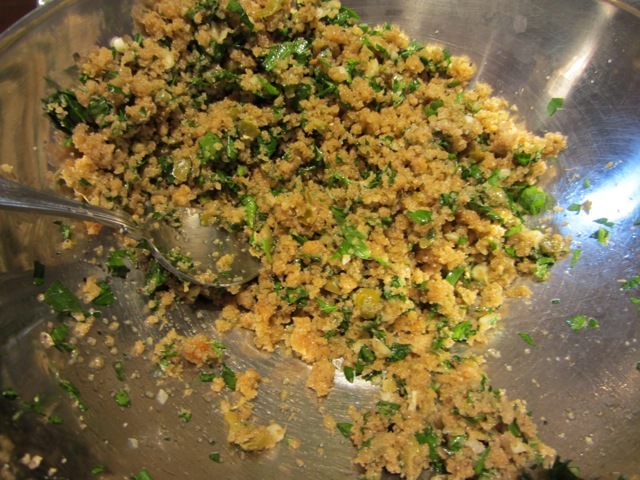 In a bowl combine the breadcrumbs, parsley, garlic, capers, oregano. Add a tablespoon of olive oil to the mixture and turn it over thoroughly. 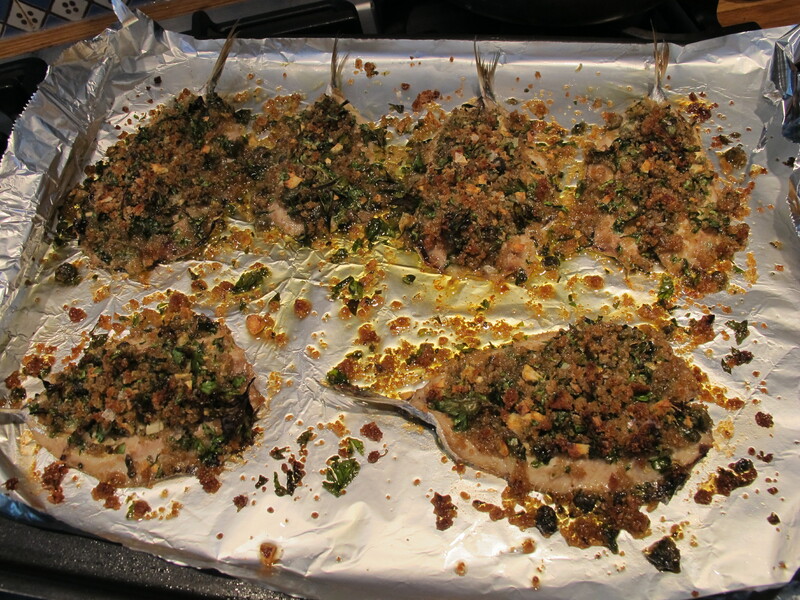 Spread the breadcrumb mix evenly over the fillets–using a teaspoon. 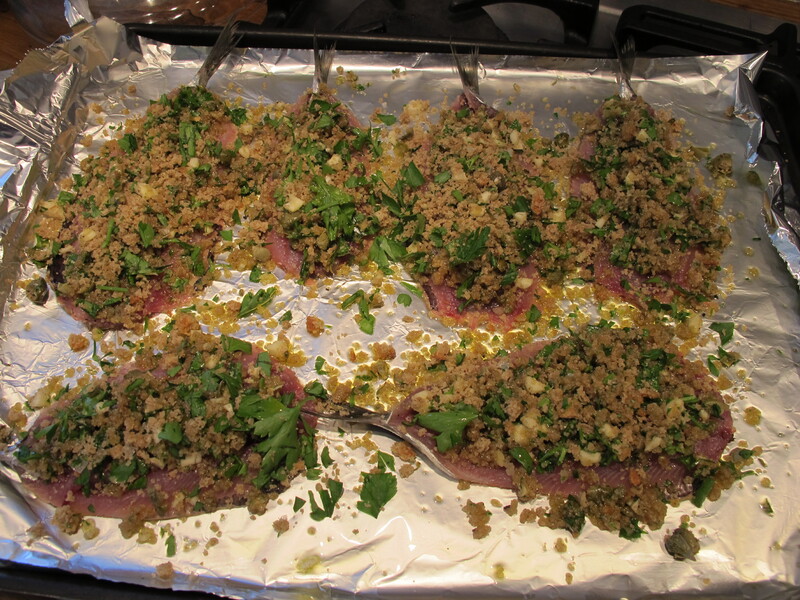 Drizzle the remaining olive oil over the fillets, adding a little extra if needed. Finish off by a short burst (under 30 seconds) under a hot grill. The sardines look marvelous and I bet they taste even better! I’m gonna try them, if I can find the fresh sardines. Not so easy in a U. S. supermarket! I love your website, Robin Ellis!